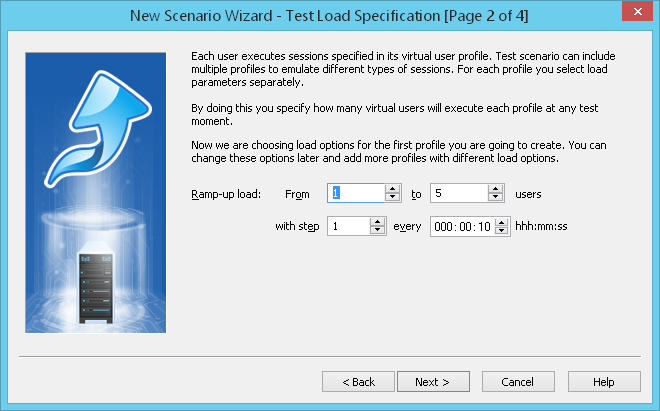 On this page of New Scenario Wizard, you can specify the number of virtual users that will participate in the test run for user load you have chosen on the previous step (constant, ramp-up or periodic). Specify a constant number of users that will be active during the whole test run. All users will start simultaneously at the beginning of the test. The number of users will increase gradually during the test until it reaches some maximum value. Specify an initial and maximum number of users and iteration step. You can also set a delay before starting the next user(s) in the every edit box. This type of load allows watching how your site responds to the increasing number of users. Periodic load consists of 2 phases changing one another: one with a low load level and another with a high load level. Specify the number of users for each phase and set the duration of phases. Periodic load is useful to test that application allocates and frees server resources correctly. If you wish to change the type of user load for your test, you will be able to do it after completion of this wizard in the Test Volume view. If you include several profiles in your test scenario, you will be able to specify all load parameters separately for each profile. For example, you can join constant (fixed), growing (ramp-up) and periodic load in the same test. Just select different types of load for different profiles. Besides, you can execute different profiles on different load agents. All these settings are configured in the Test Volume view.